The title and theme evoke the childhood wonder and simplicity found in a game that distills the complex struggles of the world into a ‘this beats that’ triumvirate. The playfulness of the theme pervaded the work, from the haunting to the light hearted. Thirteen artists put forward their contributions towards the vision, but unlike rock-scissors-paper and death matches, all thirteen may leave. In this show, rock represents three-dimensional work, scissors anything that has been cut and paper two dimensional works. While this allows much overlap, as the assignment was not scientific in the first, I will not feel fully bound in my own categorisation. Instead, let’s bound around the gallery, and see what was! When I walked through the gallery door, the masks hung on the opposite wall popped out. Steven White‘s homages to Predator have a twist of the nostalgic mixed with an ironic trophy-like presentation. All possible through the miracle of UPVC! Might have to try this stuff out myself. You are invited to indicate your insecurities on the corresponding part of the mannequin. Show the insecurity in anyway you feel appropriate. A set of black markers was made available, and by the night of the reception, the once lifeless, blank, creepy simulacrum was marked and ascribed various faults or perceived faults all over. Large freckled dots covered the arms, an outline with ‘chubby vag’ written on the crotch, crows feet drawn under the eyes, among others, all made the mannequin feel somehow more real. While the rest of the work is of a more two dimensional nature, Jo Turner’s photographs are decidedly ‘rock’ for me. They depict derelict stone work from South East Asia as it is embraced by nature, providing wonderful colour palates of an almost ancient and mystical nature. On the North wall, next to the snacks at the reception, hung the collage work of Marli Janse Van Vuuren. Two of her works relied on beautiful photography, one architectural, the other natural, cut into squares, edges bent upwards. This created a somewhat three dimensional effect as you pass by. On the same wall were the multilayered expressions of Casey Madigan. Each work is an event, which, like any real-life event, has many layers of location, movement and personal meanings. Each shape and cut is organic and filled with a lighthearted serendipity. A feeling of the antiquated, sepia toned collages and a peek into something not quite forbidden but probably frowned upon by ‘polite society’ marks Christopher Kramer’s submissions to the show. A beautiful touch was a tiny book made with silver pages, perched just below the work. I was mildly disappointed when I found there weren’t any extra images inside, but was quite blank. The booklet was either for writing notes or a metaphor to provoke thought, and since no writing utensils was provided, my guess is probably both. Celebrating comics, cosplaying and bending characters’ gender is the work of Corey Malcolm Lajeunesse. Working off the comic page, a cosplayed female version of the character is imposed over the page, the piece titled appropriately: Thora, Spiderwoman, etc. The costumes pop off the page and unite the works thematically. Together nostalgic, adaptive and questioning, these pieces put a smile on my face. Straight across from childhood nostalgia comes the nightmares. Faces, barely recognised, are mutilated, eyes and mouths are torn. A collaborative entry by Sidney Scallan and Juanita Hong, was at once the most human, and the most dehumanising of the show. Now, if psychedelic poetry of the mind is more your thing, Sentmode‘s triptych had you covered. The three pieces lay horizontally over each other, with an eye gazing out from the top, oddly reminiscent or Sauron’s tower. Or Sauron’s reverse pagoda if that’s how you roll. On the other hand Emily Read‘s water colors were much calmer addition. 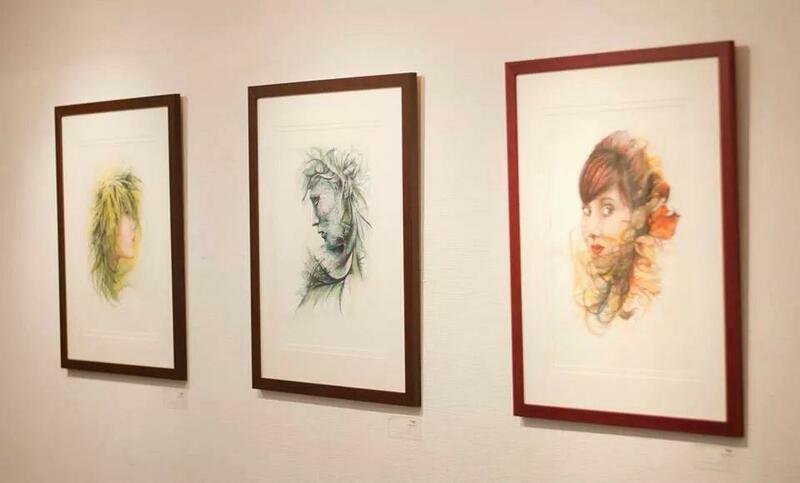 Combining portraiture with arabesque organic forms, she anthropomorphizes the seasons. Delightfully macabre, CRN presented prints of the writhing undercurrents of the human psyche. Filled with dark wings, confused flight and parables of the dark fear and fascination of death, the works jumped out at the viewers. Not quite literally, but perhaps in future iterations. Staring across from the macabre hung the more humanistic works of Tessa Guze. Her paintings rely on a strong color scheme and balance of space and person to emphasize empathy in the viewer. The curator of the show, Martyn Thompson, installed a conceptual piece based on QR codes just under the masks. In effect, he created a large, yet informationally small icon of 10 by 7 ‘pixels’. Each pixel was a QR code placed inside a name tag holder. If you had decided to follow the links, you would have found a ten minute video clip of browsing Facebook, overlaid with either white or blue. Connecting in one’s mind which QR code is ‘white’ and which is ‘blue’ allowed the viewer to make out a tiny, crude Facebook ‘f’. The star of the reception though had to be the performance by Lilith from Unending. Performed with herself, a rock, a sheet of paper, two scissors and a giant blanket, Lilith’s performance reenacted the concept of rock-scissor-paper as an emotional struggle of overcoming one’s problems. As rock got covered, scissors cut rock, and rock smashed the very thing that freed it, I couldn’t help but feel the sense that we sometimes harm and scare away the very people who try to help bring us to light. Almost as if in shame, Lilith then took the aspect of rock herself and wrapped herself in a giant blanket, almost cocoon like. Safe inside, an outsider, comes in and cuts her open, and she is reborn, stronger and without shame.